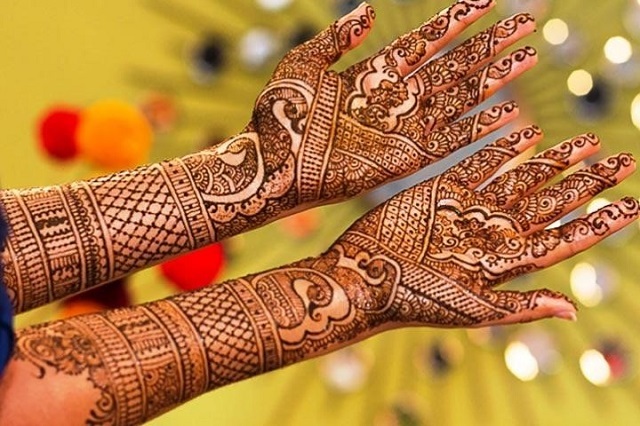 The auspicious art of Mehendi makes a bride look alluring and vibrant. This fun-filled ritual has become far more creative than we could have ever dreamt of. We see brides being more experimental today. 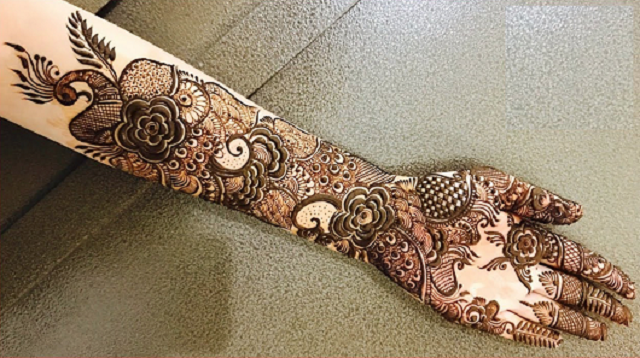 While some opt to depict their love stories through this henna art, others take the embellished route. 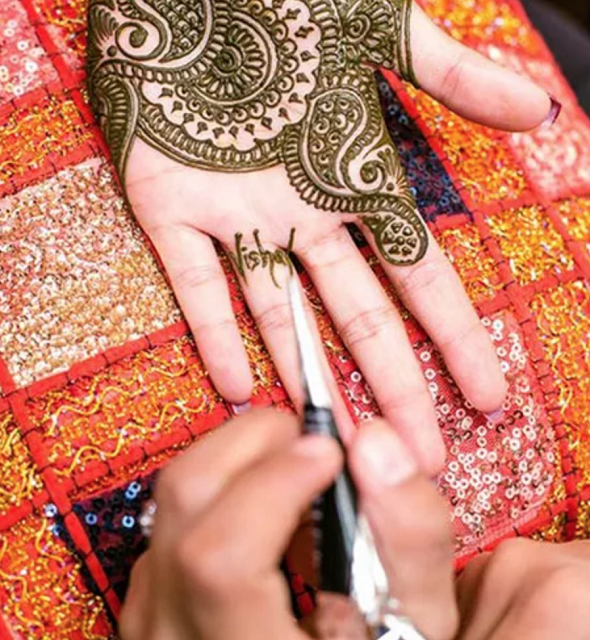 It’s time for you to step on this visual guide to find some intricate yet cool bridal Mehendi designs. 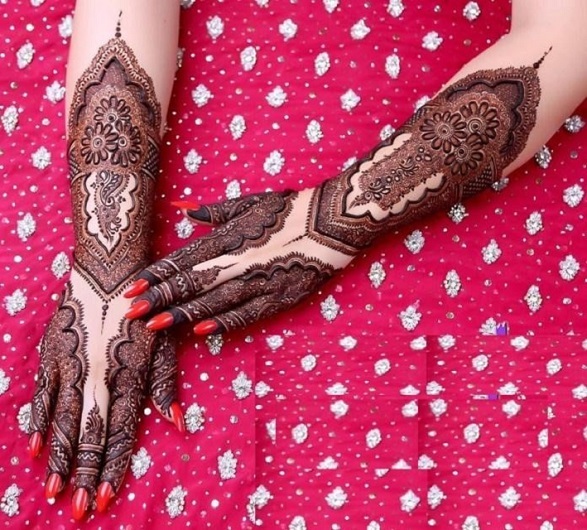 Check out the various Bridal Mehendi Designs for hands and feet in this story. 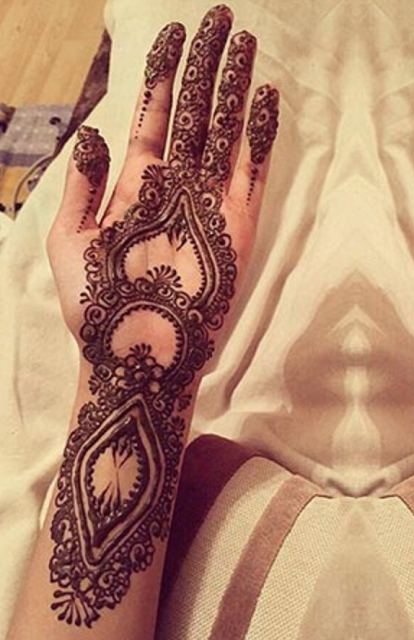 There’s nothing more picture- perfect than a mirror image Mehendi. 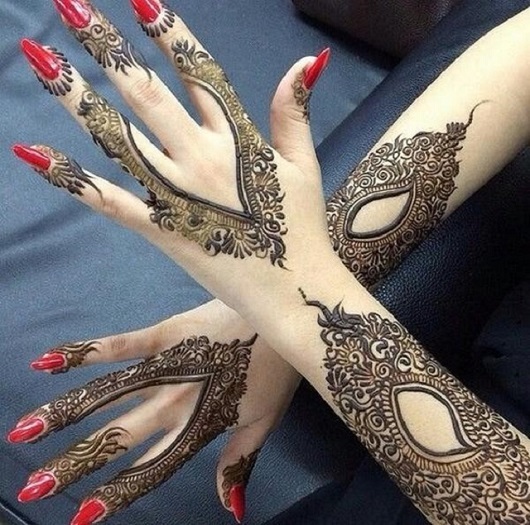 It is designed with a replication of the same patterns on both hands. Traditional or modern, you’re bound to look enchanting in any ensemble you pick with this one. 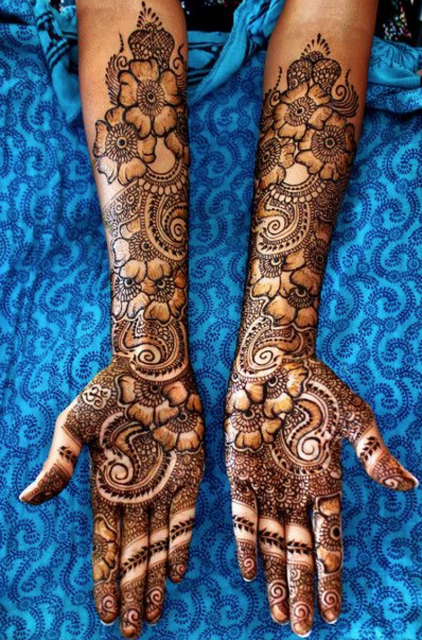 Paisley is one of the oldest leaf-like designs that is imbibed into bridal Mehendi since forever. 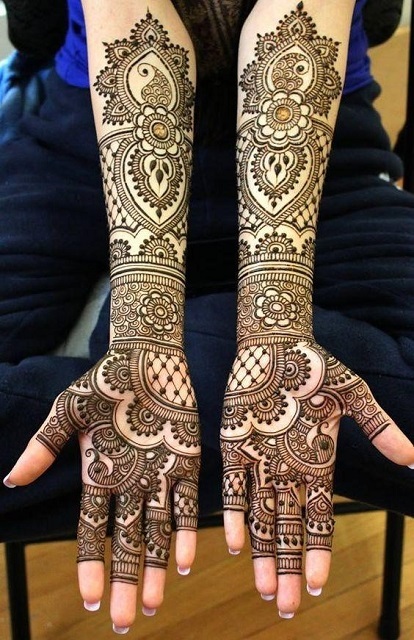 Paisley-inspired Mehendi is one of the most beautiful Mehendi designs for hands. These are not just simplistic but also equally alluring. You can combine it with teardrops, vines and swirls to make it look more decorative. This wedding season is all about catching up with the latest trends. 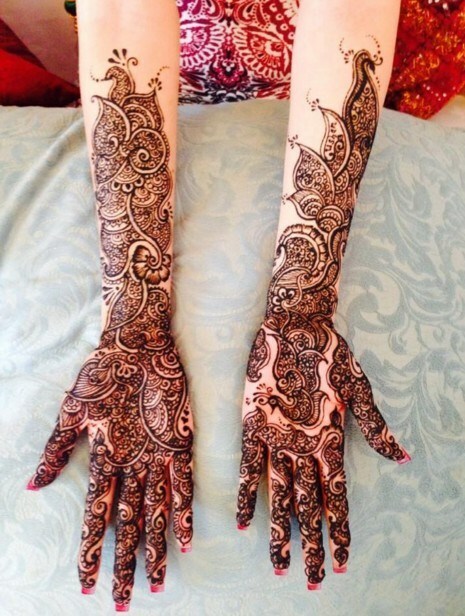 And what better than a fusion of simple Arabic mehndi design to look contemporary and on-trend, right? You can club it peacock motifs and delicate flowers for an even more flattering look. 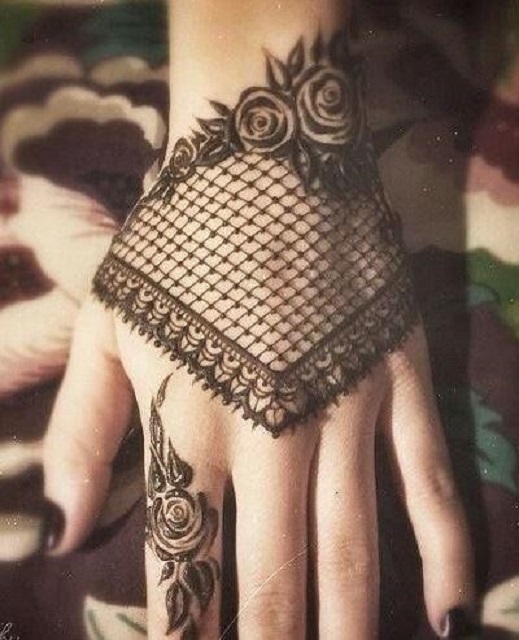 Dainty floral motifs of roses, lotus and leaves make your Mehendi look elegant and feminine. This style is by far the most popular amongst young brides who are fresh and vibrant. Personalisation never fails to impress! 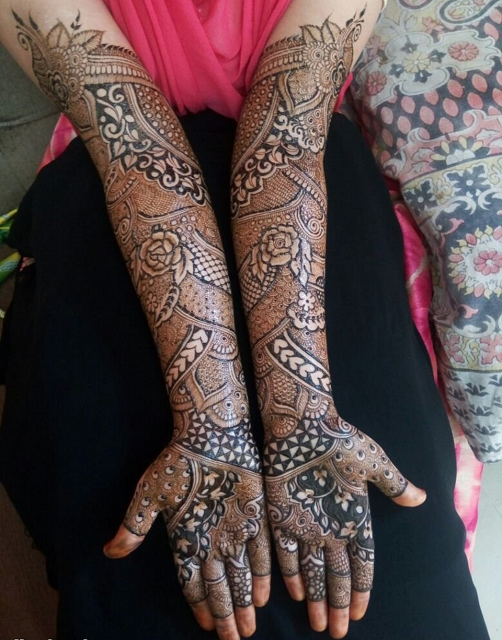 You can enhance your design by depicting your love story through a bridal mehndi image. 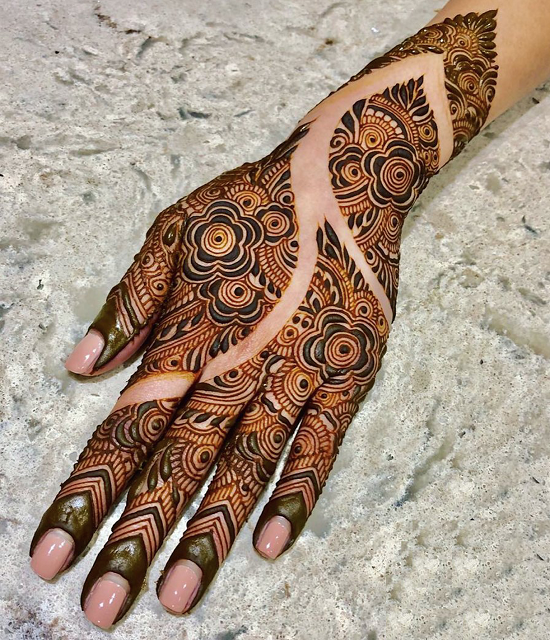 This latest mehndi design 2019 is a complex one and requires immense visualization to pull off. 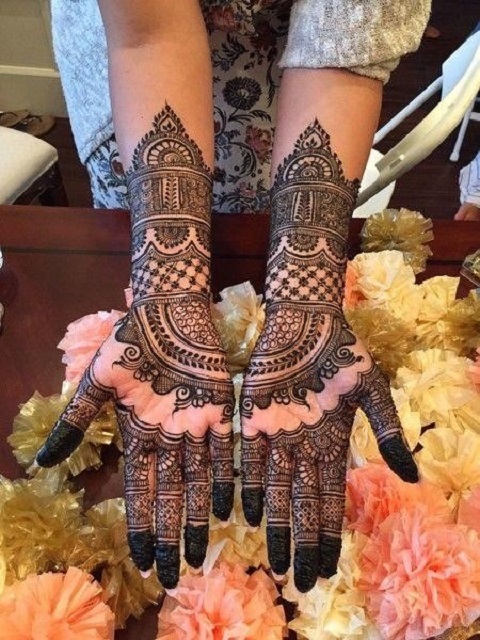 Peacock is a popular Dulhan Mehndi Design and one of the latest Bridal Mehendi designs that symbolise prosperity and good luck. If you want something cultural, then you must pick an exquisite peacock pattern to serve the purpose right. 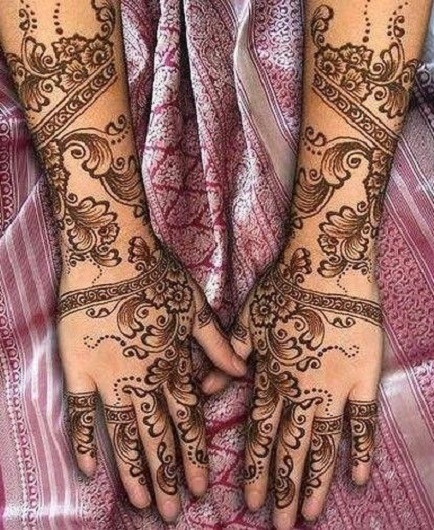 This works great as one of the bridal mehndi designs for full hands. Mesmerise your love by carving a pleasing picture of Lord Krishna with the goddess Radha to signify your eternal love for him. When combined with blooming flowers and leaves, this image illustrates nature and the start of a new life. Ganesha is the lord of peace and is often worshipped to prosper in new endeavours of life. Exhibiting an image of the same can help signify this essence during the time of celebrations. Grown for ornamental use, creepers are climbing plants that look stunning when paired with tiny leaves and checks. This style is ideal to execute easy motifs crafted with complexity. Opt for an extravagant display of affection with a medley of romantic roses imbibed into your Mehendi design. 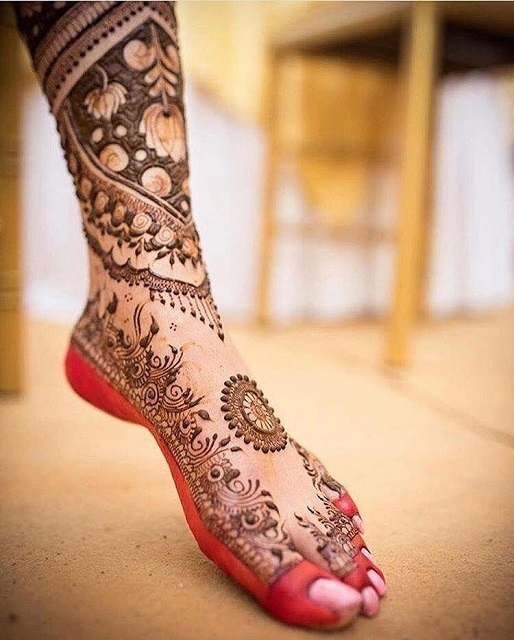 This bridal Mehendi design is surely a reflection of pure grace. Twist up a classic Mehendi design by pairing it with a checked detail. 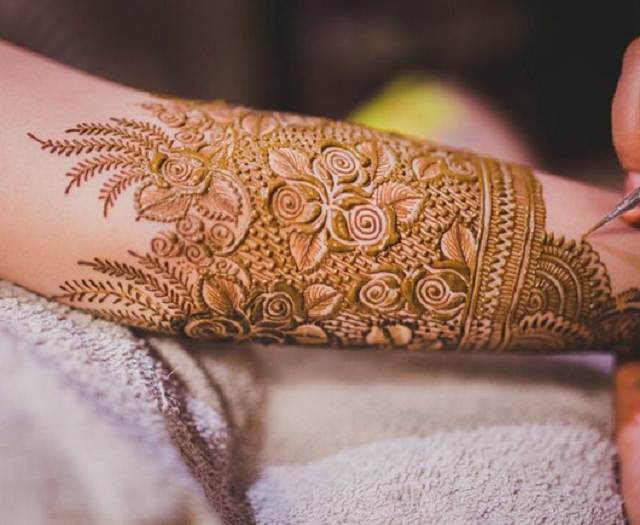 This modern bridal Mehendi gives an impression of an artsy lace cover-up and looks absolutely endearing. 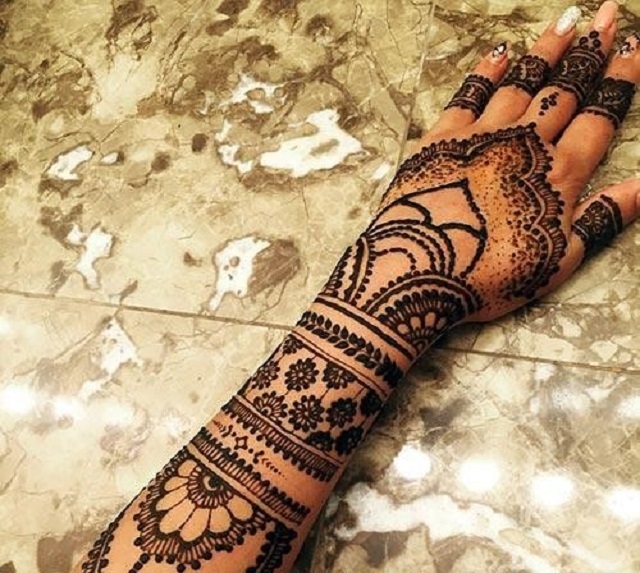 Bracelet style Mehendi designs are seemingly becoming the talk of the town. These are designed in a layered manner and mostly finished off with a curvier pattern towards the elbow. Mango leaves symbolise high spirits during auspicious ceremonies. A typical mango design comprises of leaves drawn in repetition to create a magnificent look. 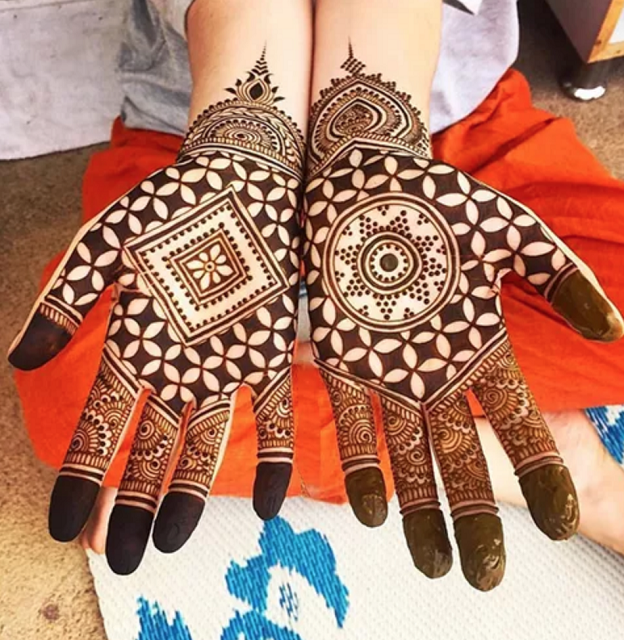 Half and half Mehendi design is the one which creates a full picture when both the hands are joined together. 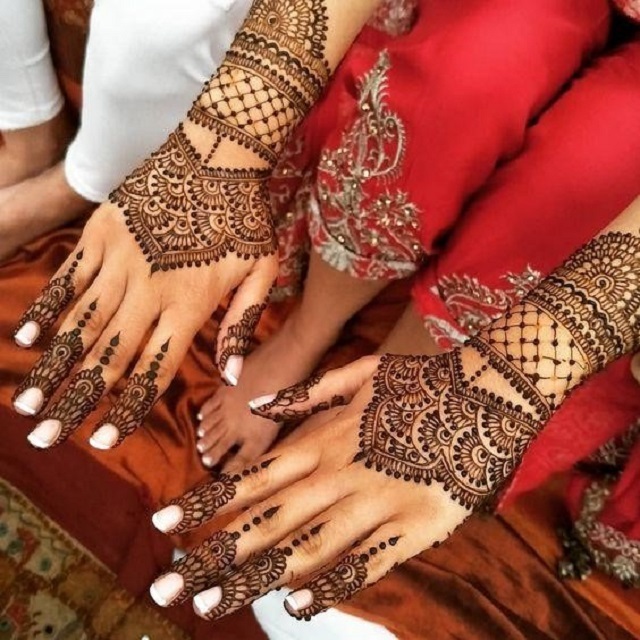 This style is a hit amongst women who want to symbolise their love story by opting for the bride’s figure on one hand and the groom’s figure on the other. 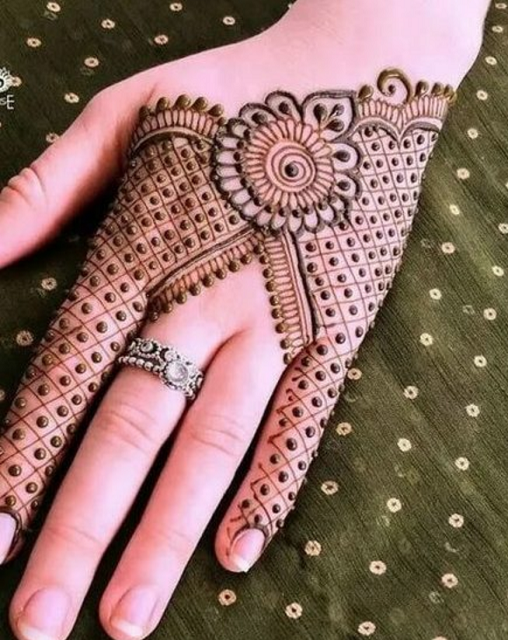 Pakistani Mehendi designs are famous for their intricacy and uniqueness. This style is not just fashionable but also looks extremely fancy. 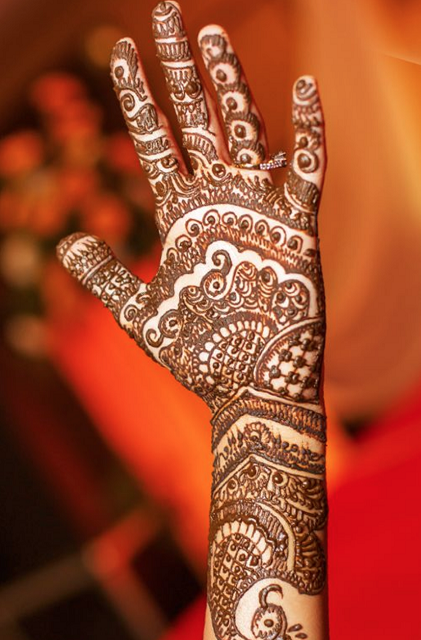 ‘Diamonds are forever’ and so is the Mehendi that exhibits this evergreen beauty. A diamond motif is an epitome of richness and class. 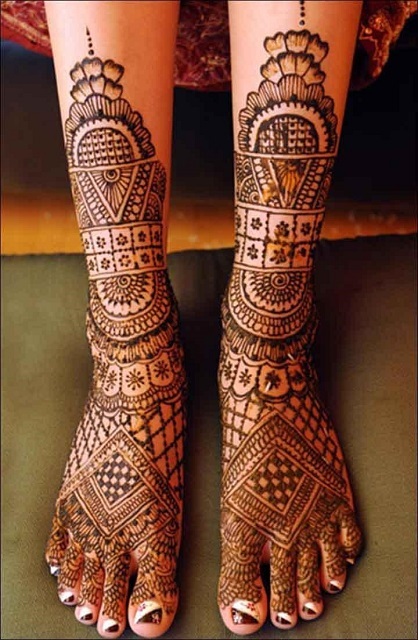 This also classifies as an ethnic modern bridal Mehendi for the ones who prefer a hint of vintage. 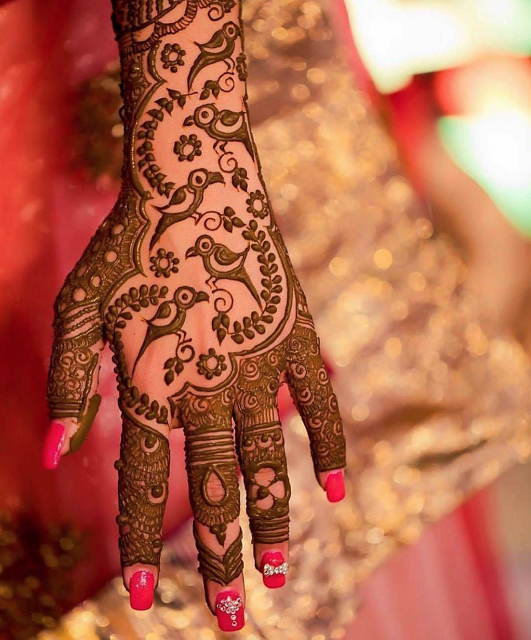 Intricate motifs and detailed layouts make even a simple Mehendi design look aesthetically appealing. Most of the Mughal inspired patterns include portraits of kings and queens to give it a more regal look. 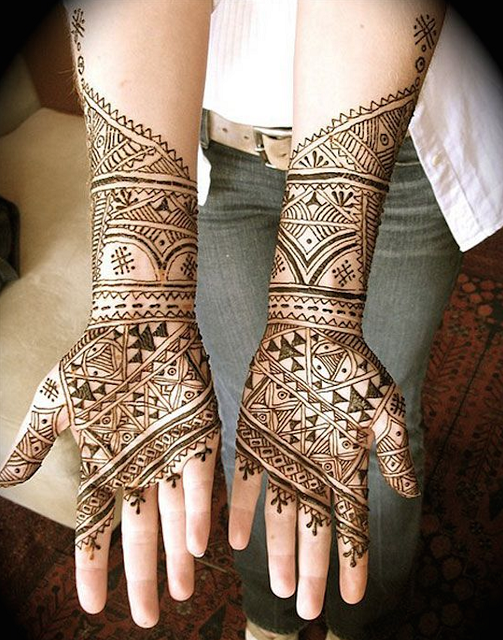 From easy Mehendi designs to detailed ones, no Mehendi is complete without the use of geometric shapes. 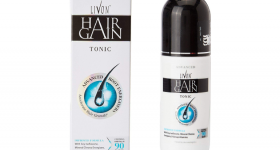 The versatility of this helps create ‘n’ number of styles to suit every taste. 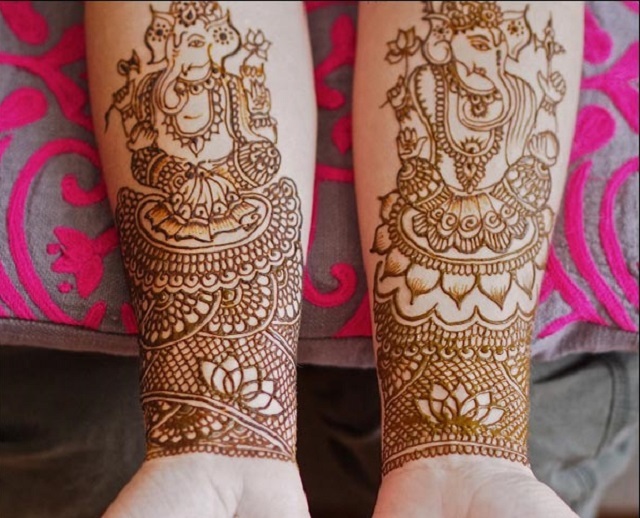 Reflect a sense of wisdom and loyalty by picking an elephant motif to be carved into your Mehendi design. This style looks majestic, grand and oh-so royal. Blooming Lotus signifies purity and grace. This extraordinary motif looks even more exceptional when crafted within a dome or a chakra (wheel). 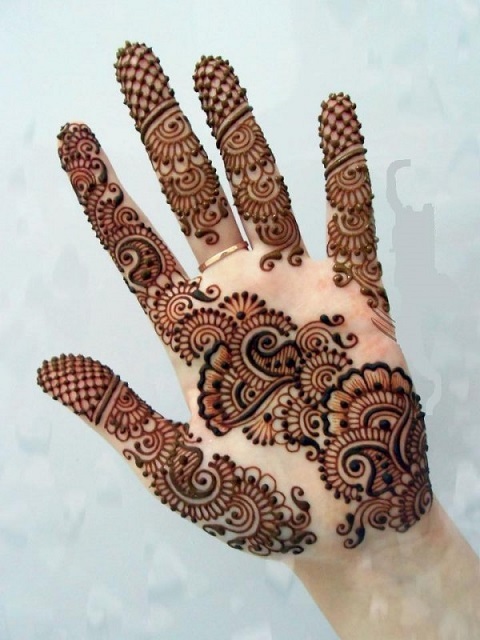 Mandala is a circular motif placed usually in the centre of the hand as a base to the entire Mehendi. It can be combined with almost any other pattern for an intricate look. 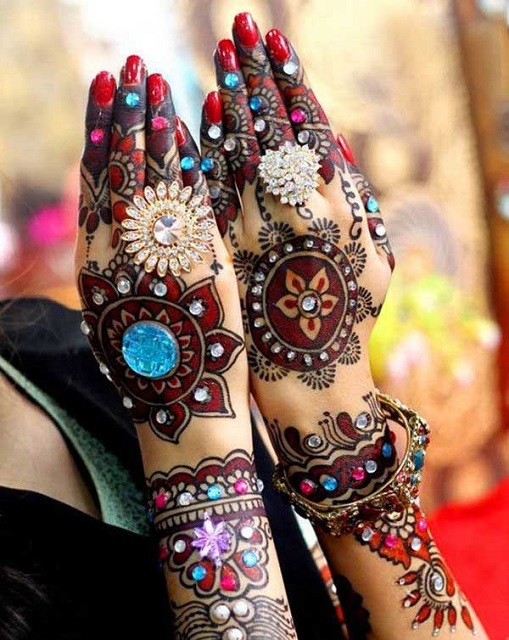 Pick from an enormous array of colours to make your Mehendi design look dazzling and vibrant. The rainbow-like effect of different colours makes this style a desirable pick for trendy brides. 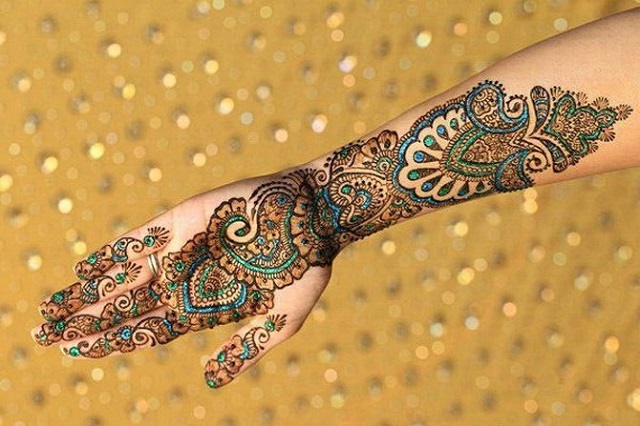 Gleaming glitter can make your Mehendi look sparkly and surreal. This style usually lasts up to 6-8 hours making it perfect for conventional rituals and ceremonies. 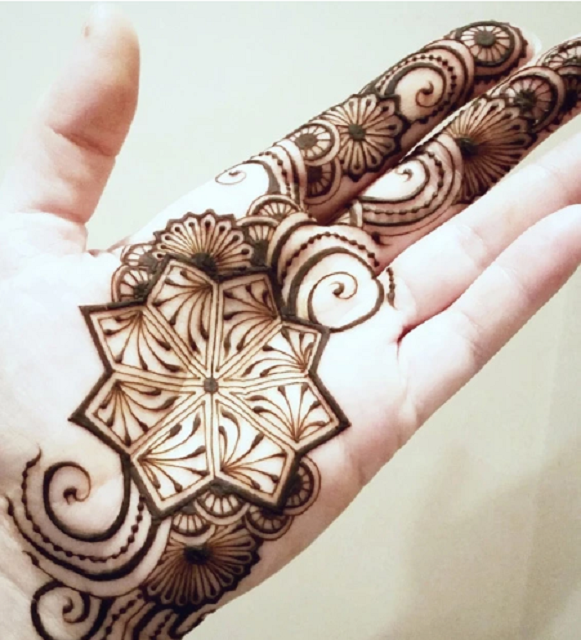 A mandala is at the centre of your Mehendi design and comes in diverse patterns. 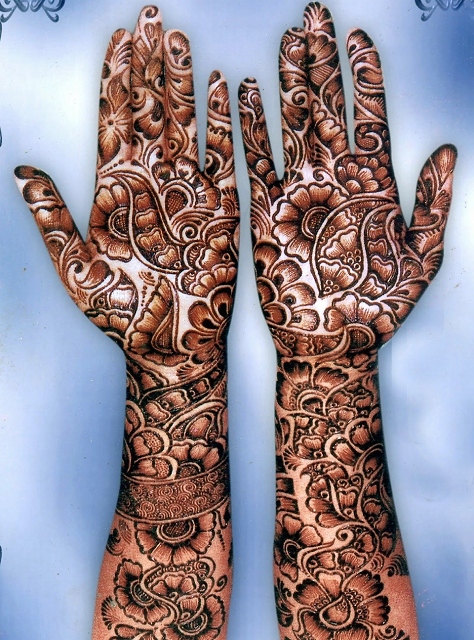 The most uncommon and intriguing one is a split mandala which is carved using a half and half design on both the hands. Jaali, dotted or floral, cuff Mehendis can be curated in multiple designs. You can pick one with a checked band impression on the wrist clubbed with a chakra, peacock, dots and vines. Step up your ethnicity by picking a stone-studded Mehendi that imbibes embellishments into your designs. 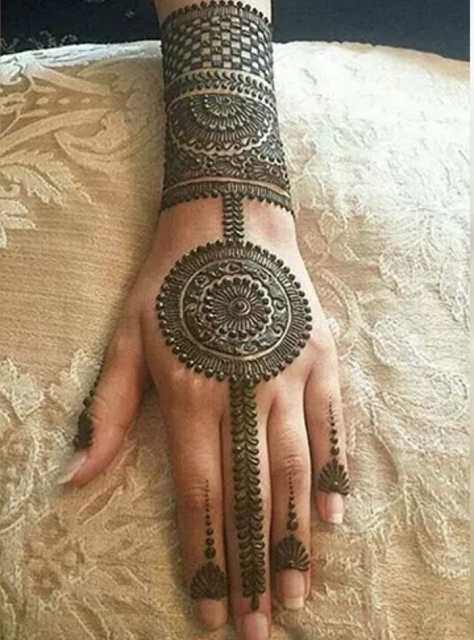 This style is creative and makes your Mehendi look fashionably unreal. 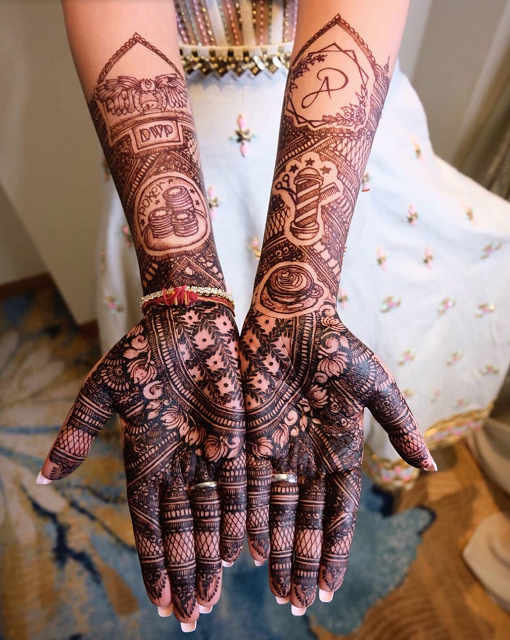 It is believed that getting your partner’s initials written in your Mehendi design signifies love and good luck. It is also adorned as a gesture to flatter your special someone. Simplistic designs and minimal patterns are new things in town. From outfits to Mehendis, today’s brides are opting for low-key trends to look subtle yet sophisticated. Butti is a minimalistic pattern that looks dainty and elegant. 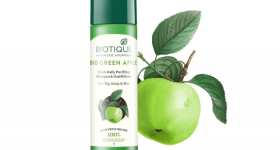 You can combine it with a jewelled detail to make it look more decorative. Parrots are often associated with being the messengers of love. Imbibing a parrot clubbed with leafy and floral motifs into your Mehendi design can exhibit a soothing picture of the pretty nature. We live in the Instagram generation and approve of nothing other than everything cool. 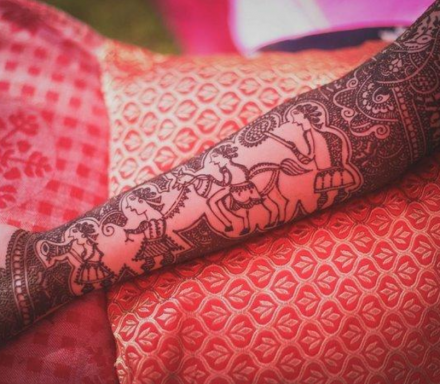 And when it comes to being cool, what better than getting your wedding hashtag carved in the Mehendi design, right! 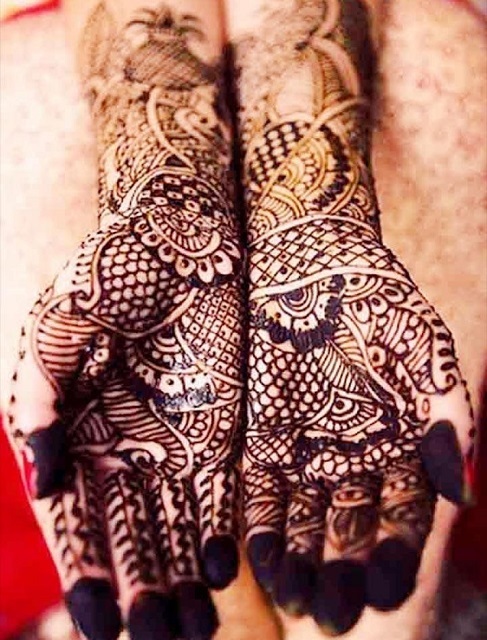 Ancient yet charming, Victorian Mehendi is one that incorporates a delicate jaal design. These look classy and poised while being absolutely vintage. 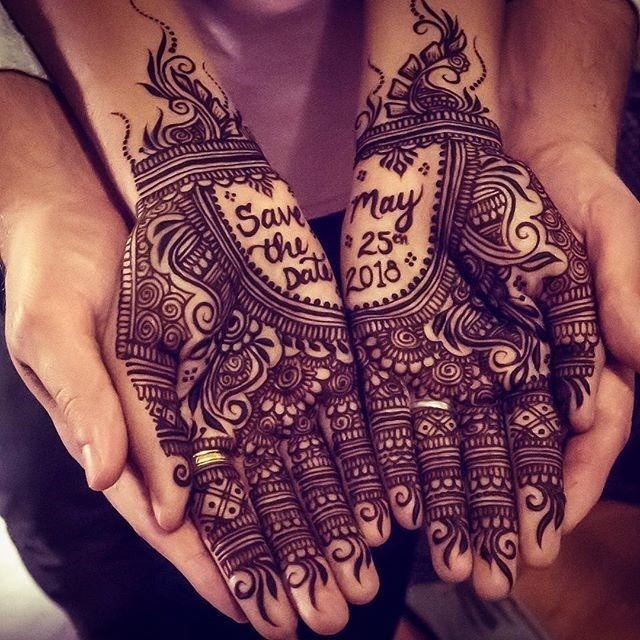 Shower the promise of commitment and love by choosing to get some heartfelt vows written in your Mehendi design. 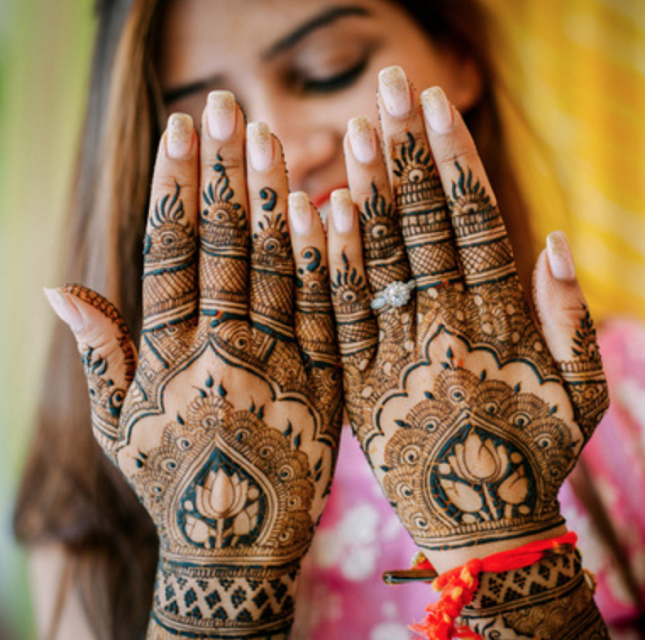 These are sure to make your Mehendi more personal, emotional and a tad bit inspirational. A jhumka earring is an essential accessory to enhance a woman’s femininity. Adding jhumka motifs into your Mehendi design gives it a more flattering appeal. You can even combine it with leaves, swirls and paisley patterns for a fuller look. 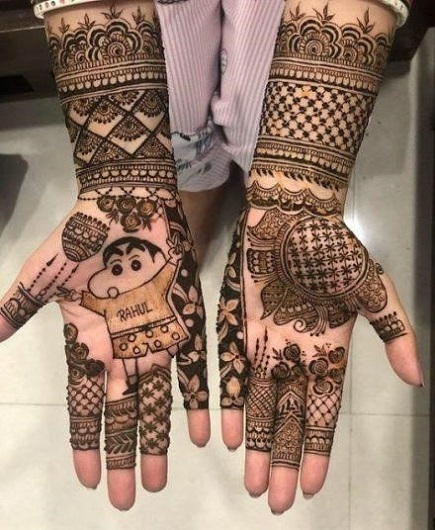 Bring out your inner child by opting for a playful cartoon character to be designed on your palms. This idea is as fascinating as it is fun. Indian culture is a pool of preaching with specific meanings for each. These are usually referred to as shlokas. You can pick some of these engaging words and add them into your Mehendi design to make it look more distinctive and personal. 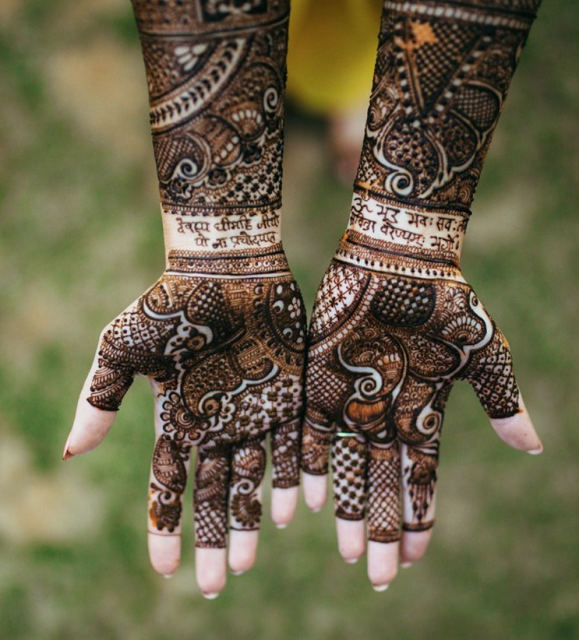 Dots may seem like the most basic Mehendi pattern but can sum up to form some of the most intricate designs. You can opt for a dotted jaal or something more open- spaced like a dotted buti. 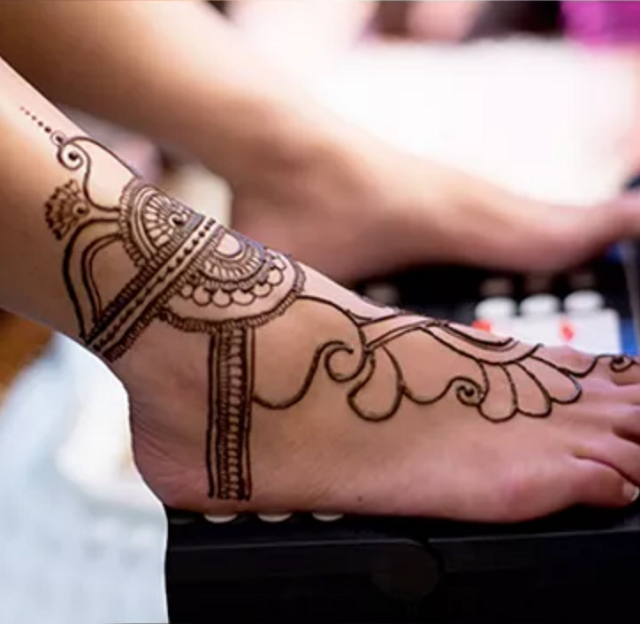 Easy to apply yet enchanting, spiral bel Mehendi designs are for those who want something minimal and clean. You can even intertwine the bel to make it look more flowy and glamorous. 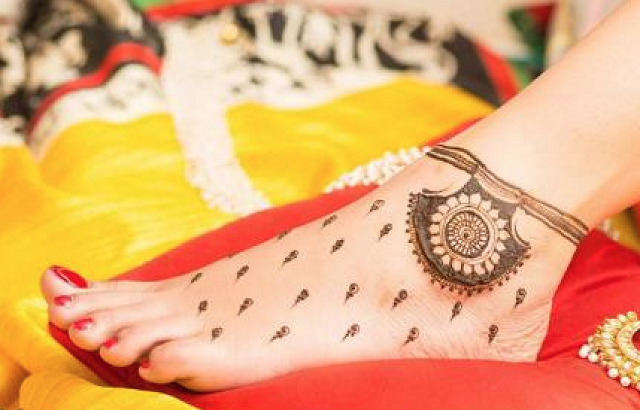 Mimic the evergreen old woman charm by picking an anklet Mehendi design. 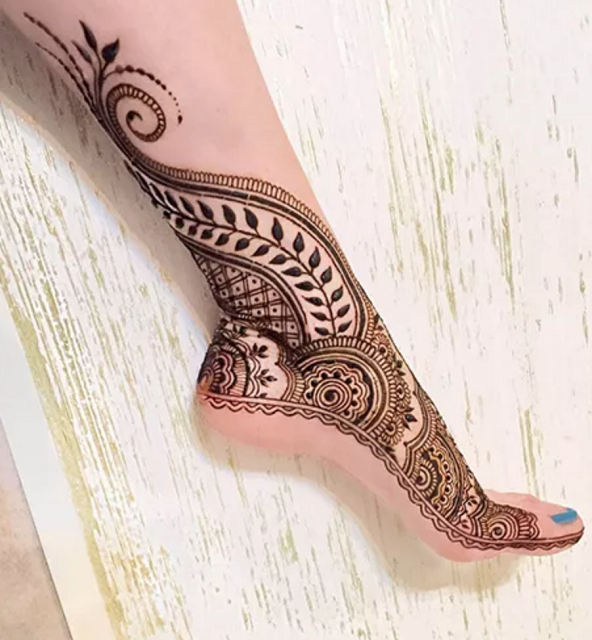 This style gives the illusion of wearing a traditional anklet. 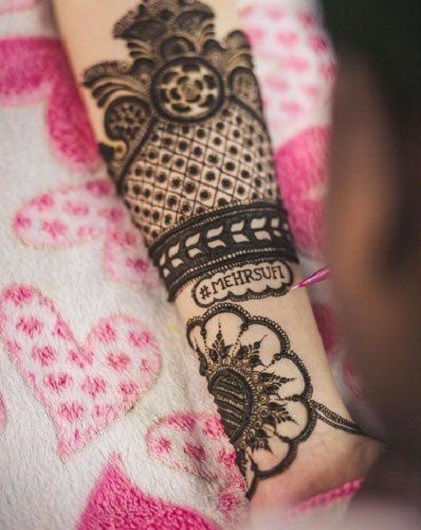 Make your Mehendi look more edgy and fun by opting to add dates and messages to it. ‘Save the date’ is the most common idea under this category. 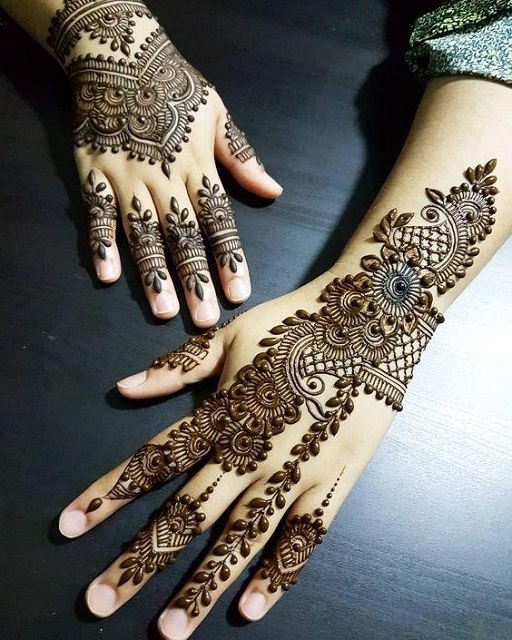 The trendiest bridal Mehendi design is by far the one that infuses images and motifs of things or beings that are close to the bride’s heart. A picture of the dog, favourite food are popular examples of the same. Originating from the Arab culture, domes are ancient architectural designs. These motifs start from the wrist and go up in a spire-like formation. 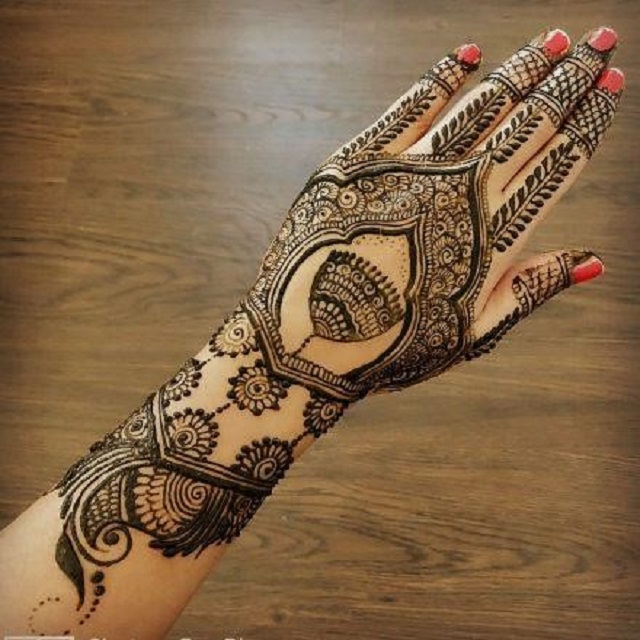 Look exquisite in this one-of-a-kind Mehendi design that incorporates curvy swirls with dotted edges. This one’s bound to make you fall in love with its effortless and chic vibes. From mirror effects and chadar design to floral motifs and a jaal pattern, this Mehendi design is all that you could be looking for. You can even replace that jaal effect within the heart with your partner’s name. 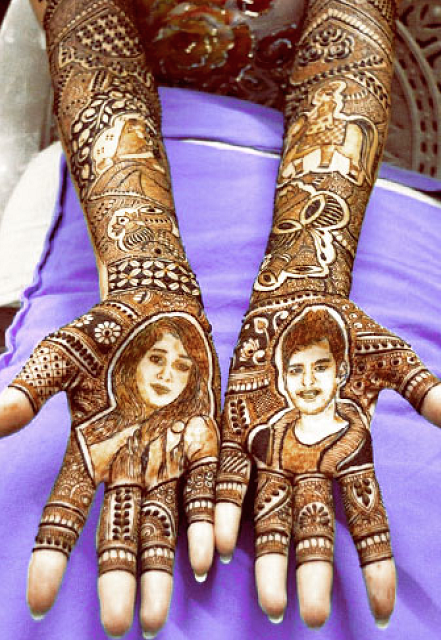 A heartwarming touch to elevate your Mehendi design is to get portraits of you and your partner on each palm. The images are surely difficult to pull off but also so worth it. 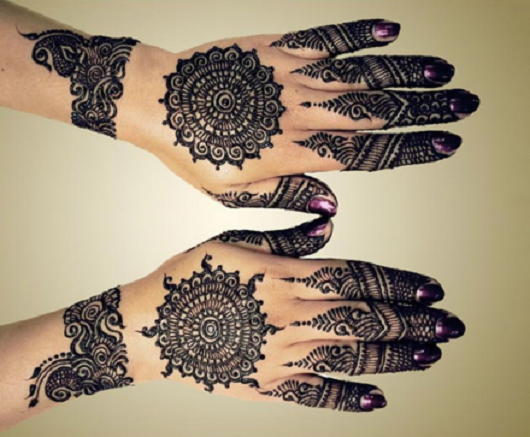 Polish up your Mehendi rituals by picking a curvy Mehendi design. Make this style look absolutely stunning with a consistent thickness of border throughout. 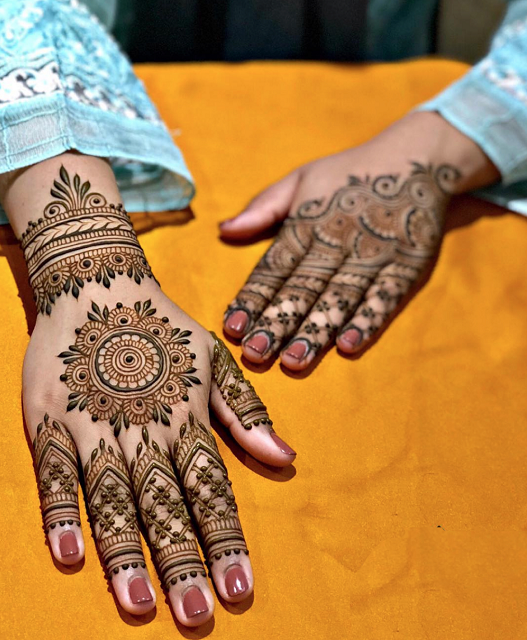 Highlight each part of your Mehendi by opting for a layered design. Each tier of this style is segregated by an empty space making the design look clean and crisp. Alta is a red dye that is applied by Bengali brides to signify the times of celebration and joy. 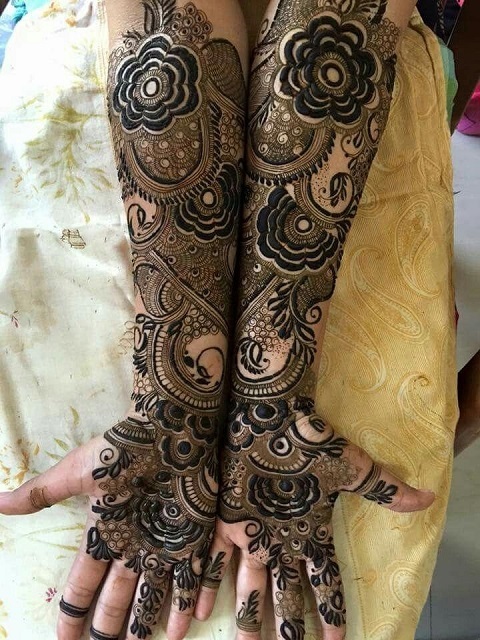 Combined with a regular Mehendi design, these look unique yet pleasing. 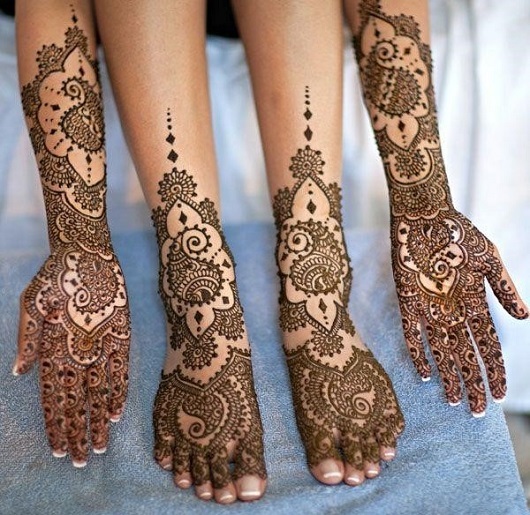 Most of the South Indian brides opt for a Mylanchi Mehendi design which originated from Kerala. Mylanchi motifs are curvy and highly decorative. 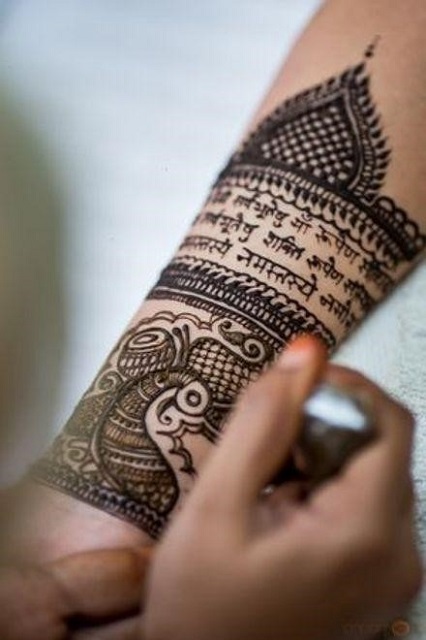 Marathi Mehendi is a design that is applied using sticks rather than a cone to give it a darker colour. This style is a bundle of cultural charm. 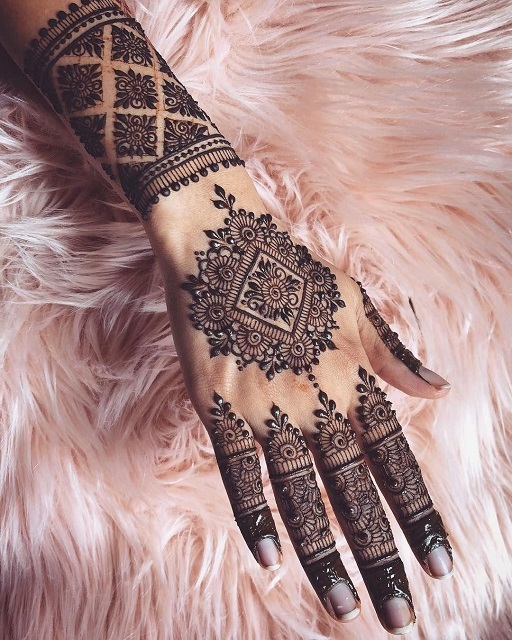 Khafif Mehendi is a modern take on traditional Arabic designs. It blends unconventional and on-trend patterns with a classic vibe to make you look utterly glamorous. 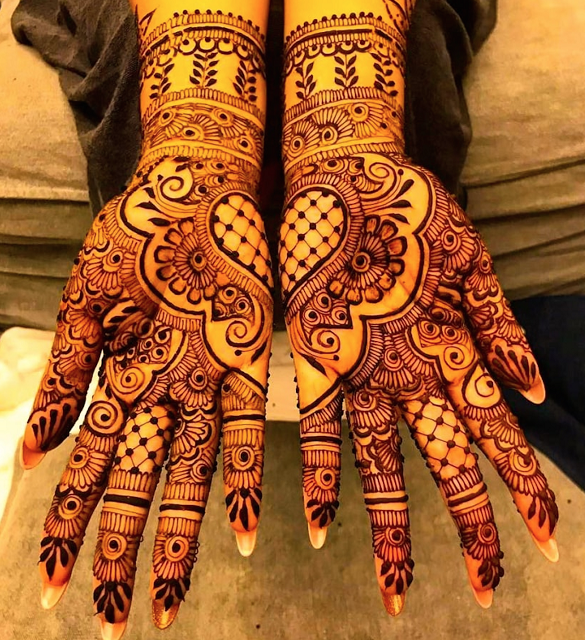 African Mehendi designs are a reflection of power. These combine abstract and leafy motifs combined with dainty dots to make you look bold. Detail is what defines an ideal Turkish Mehendi design. This style pays special attention to intricate motifs and clubs them with floral, linear and curvy patterns in a spaced-out manner. 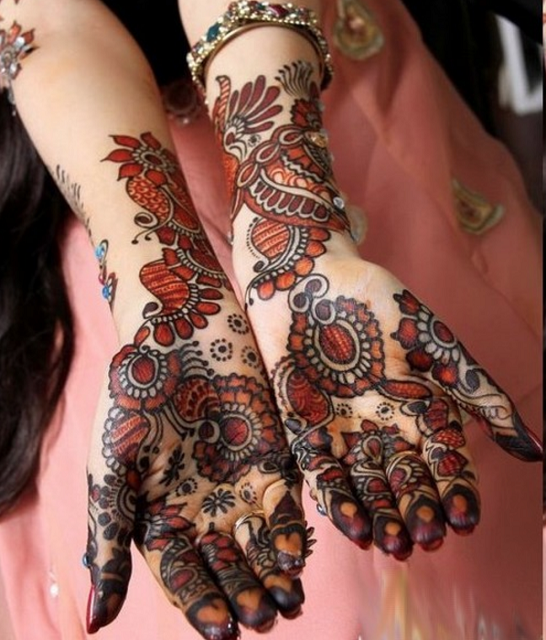 Pakistani Mehendi design is one that infuses Indian motifs with Arabic designs. This style is rich and bold while being dipped in complexity to make you look regal. Punjab is the region of joy and excitement. 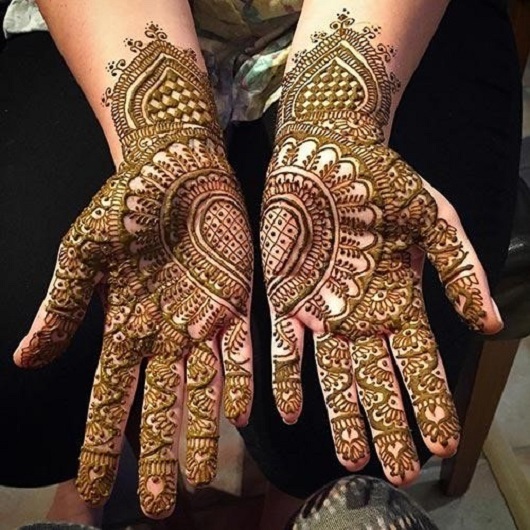 Thus, Mehendi designs originating from Punjab exhibit a vibe of celebration and fun. 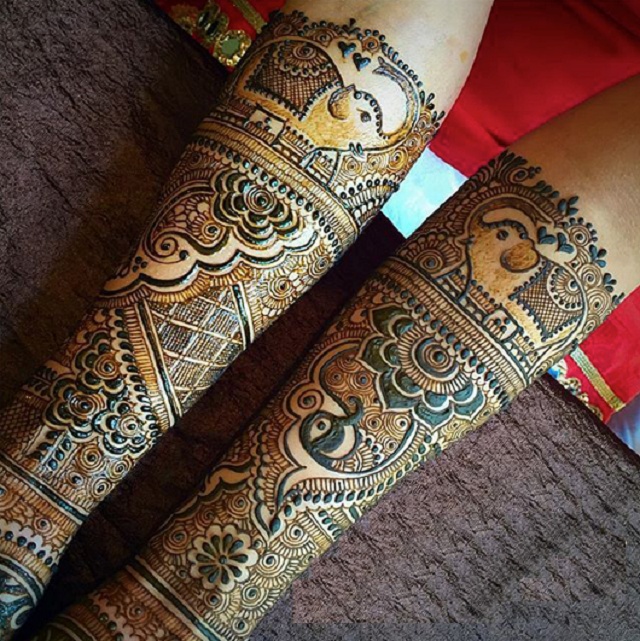 Rajasthani Mehendi depicts its rich folk culture. 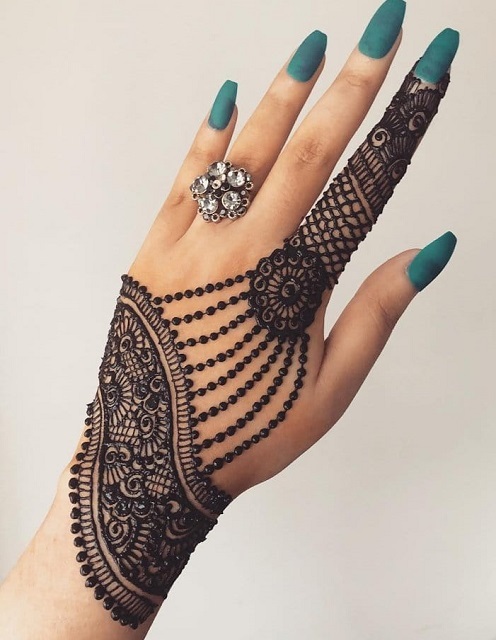 This style replicates intricate and thoughtful jewellery-like designs on both hands, much like the mirror image. 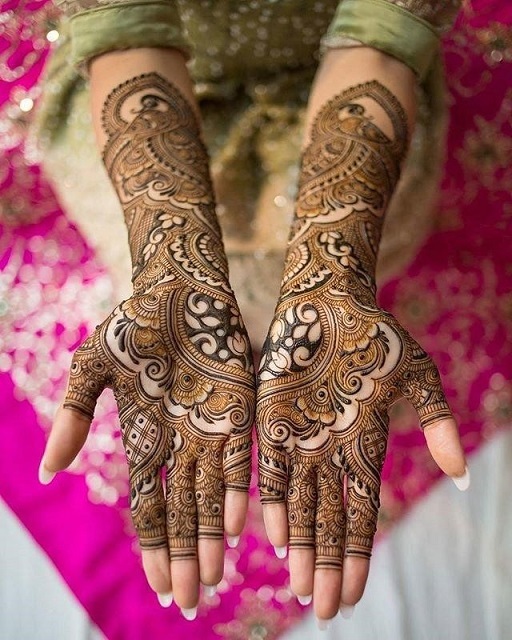 Extravagance is the second name for a Gujarati Mehendi design. These are unique and innovative while being elaborate and grand. 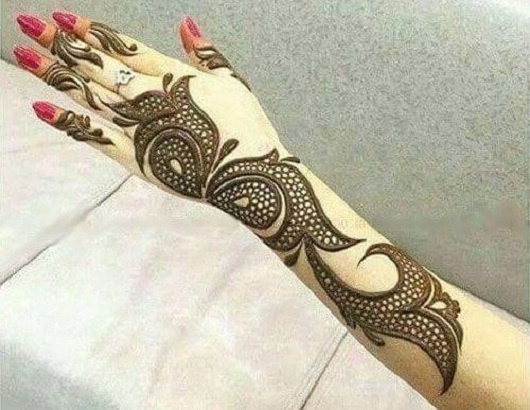 If you like things exotic and unique, then you must opt for a Moroccan Mehendi design. This style is a contemporary take on ancient motifs. 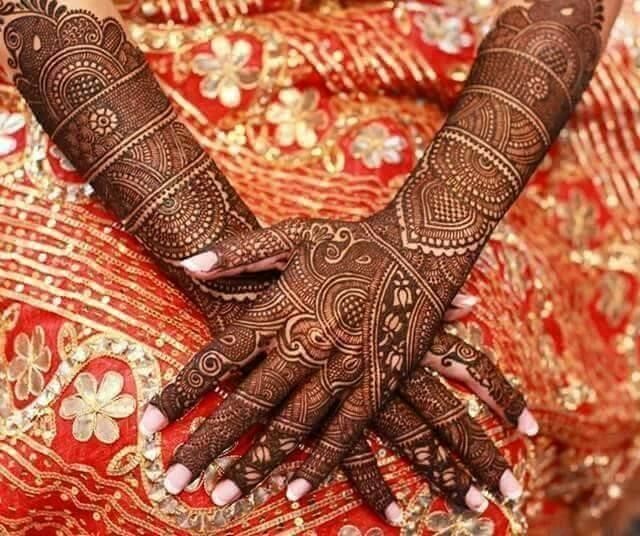 Tribal Mehendi originated from the times when warriors used to carve them on their hands to denote power and pride. This style uses an amalgamation of linear and circular patterns for a strong look. 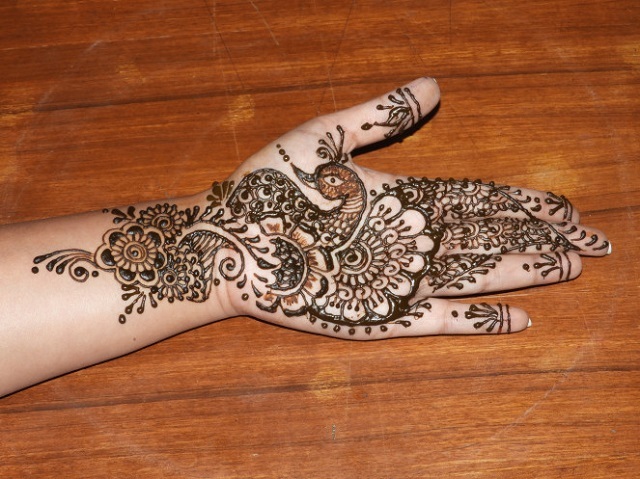 Go for something hassle-free with an easy Mehendi design that incorporates leafy motifs. These look even more gorgeous when combined with florals, Jaal, or paisley. 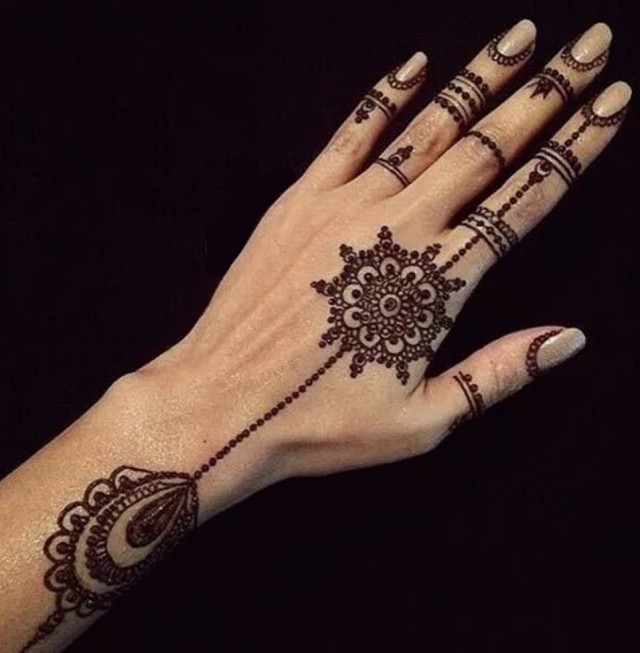 If you’re feisty, then you must experiment with a white Mehendi design. This one is sure to make you stand out with its uniqueness. 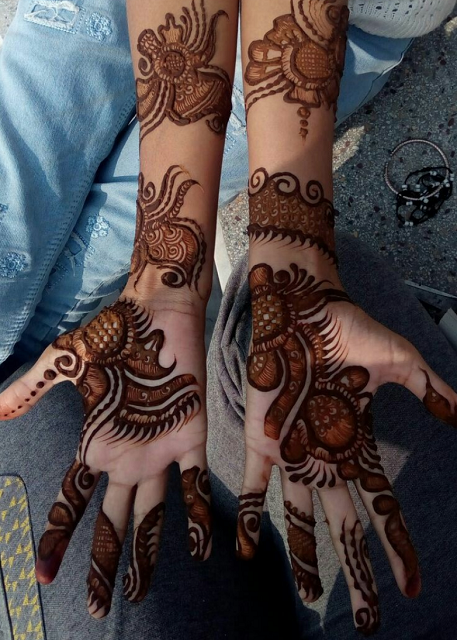 Add more structure and illusion to your Mehendi by picking a shaded design. This style is also known for its 3D-Effect and design enhancing abilities. 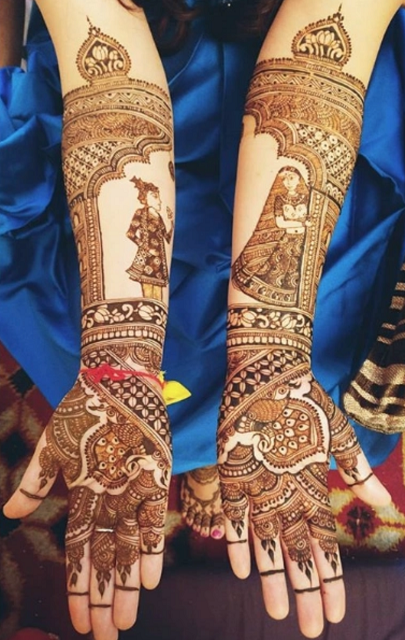 Elevate your Mehendi with a magnificent Full-Baraat design. 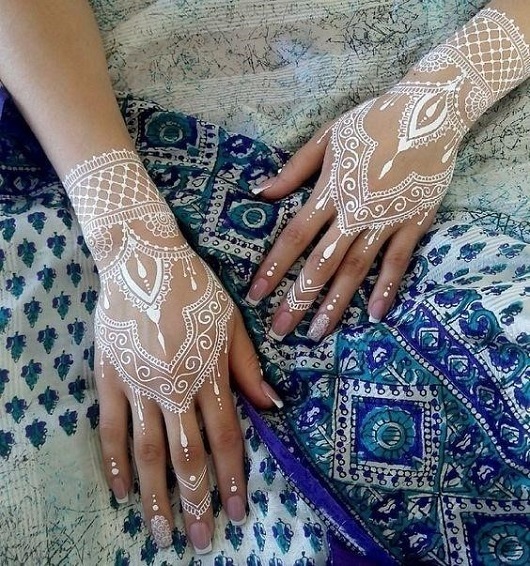 This style is seemingly becoming a popular choice for brides who like intricacy and detail. 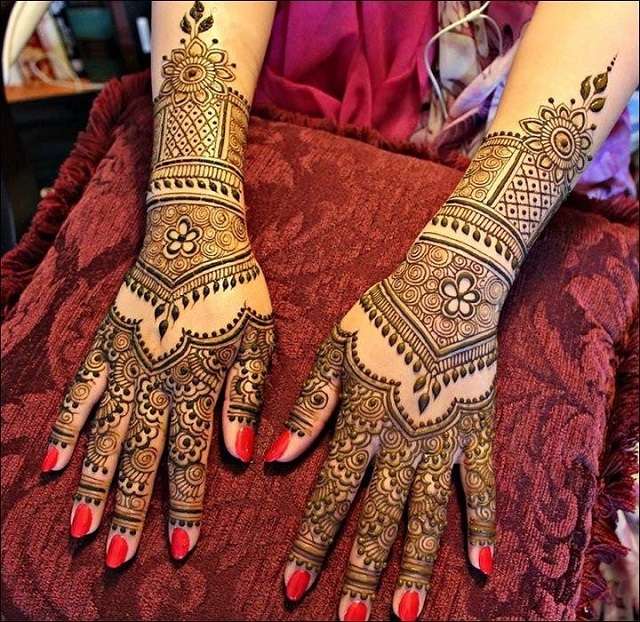 The fusion of Arabic art’s modernity and Indian art’s ethnicity gave birth to the Indo-Arabic Mehendi design. This style is a hit amongst younger brides who like to keep things contemporary and trendy. 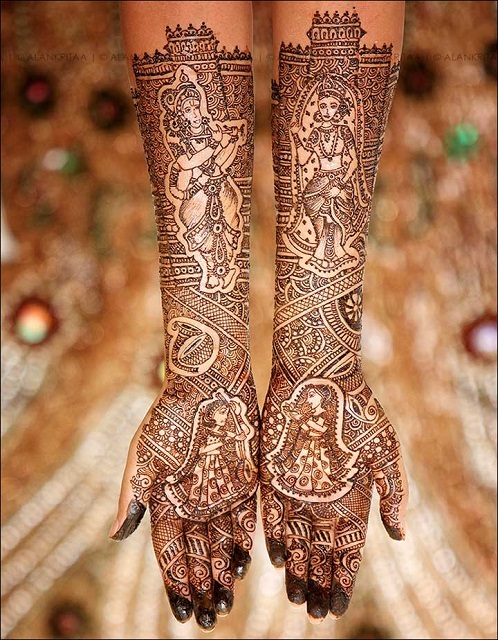 A three-tier Mehendi design is one which is crafted in different sections segregated through empty space between each. All three parts are filled with intricate details and finished off with clean borders. Modern brides are always on a lookout for something fresh and trendy. 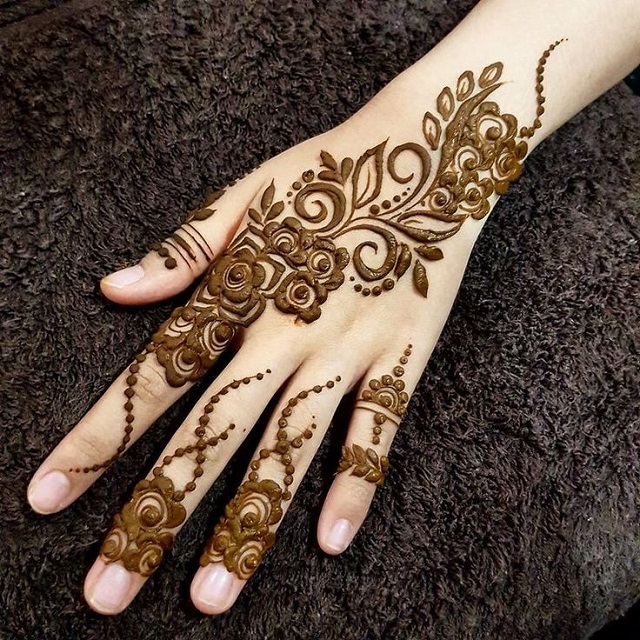 Abstract Mehendi designs are here to serve the purpose. The style encloses distinctive patterns to give away a sharp look. 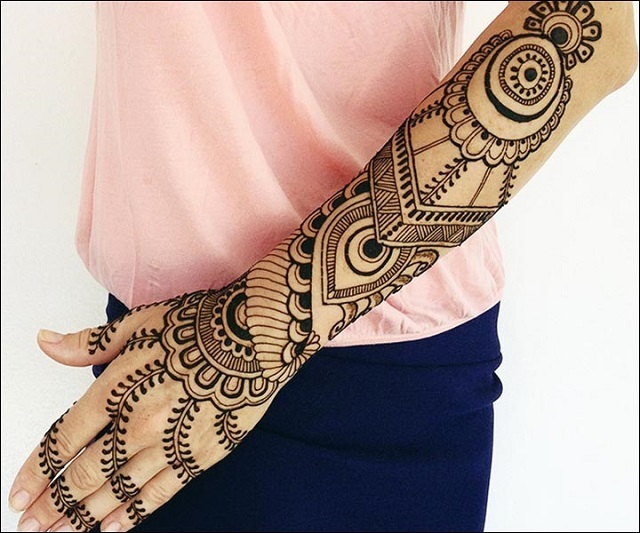 Add a dash of ethnicity to your bold persona by opting for a border Mehendi design. This style is symmetrically appealing and visually clean. Make your loved ones feel even more special by opting to get their names engraved into your Mehendi design. This style is a great way to make that ‘extra’ gesture. 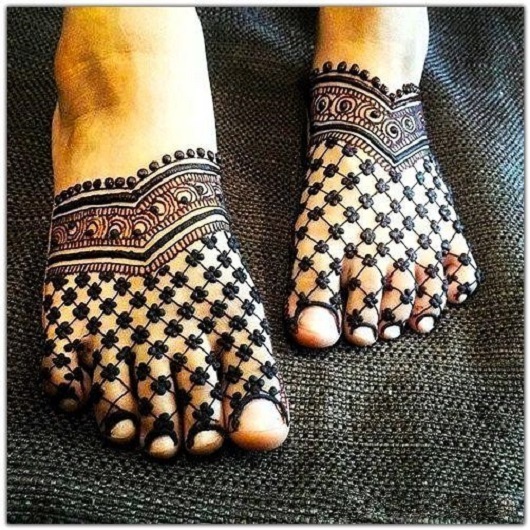 If you work on the philosophy of ‘less is more’, then you must opt for a half cover Mehendi design for your feet. This style covers only one side of your foot and goes up till the ankle. 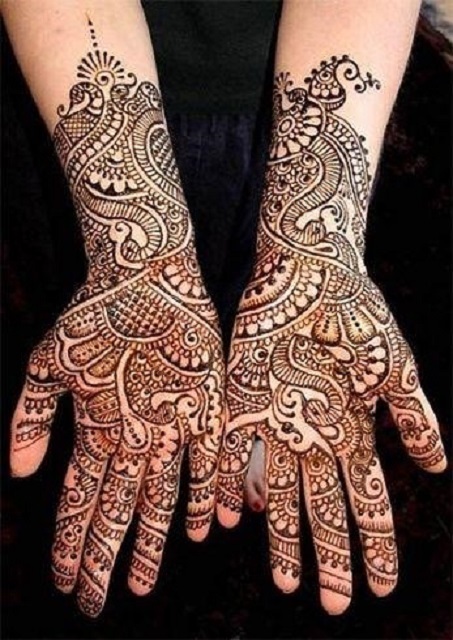 Avoid the cluster and opt for something cleaner with an outlined Mehendi design. This style is crafted with thick borders while the inside of the motif is kept empty. 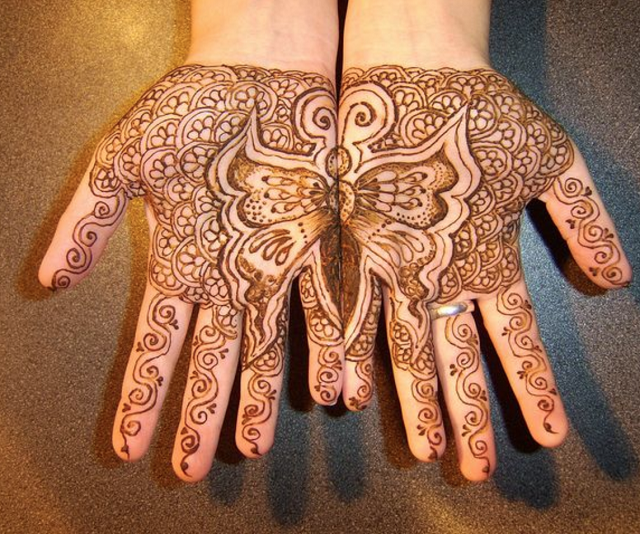 Denote delicacy and exquisiteness with a butterfly Mehendi design. People view butterflies as a symbol of growth and hope. These motifs are often associated with our soul as well. 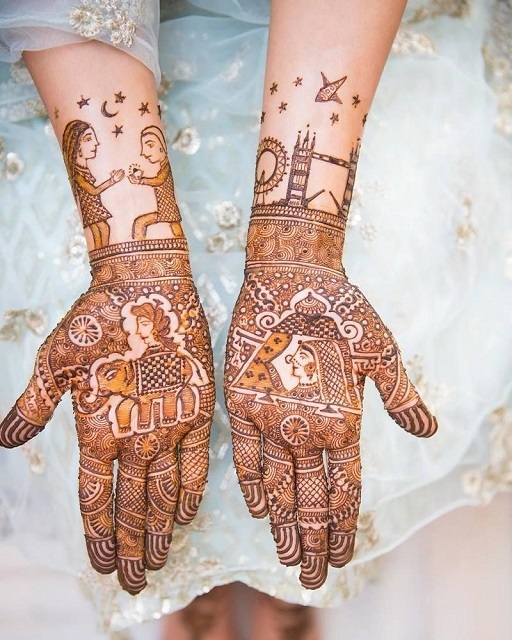 It’s time to dazzle in celebration with a starry Mehendi design. These can be made in the form of Chakra to look more ethnic. Who knew that two distinctive patterns could form ‘n’ number of charismatic designs? All you need to do is pick two standout patterns and combine them together in repetition. 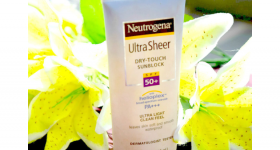 You just cannot go wrong with this one! Rangoli is an essential part of Indian culture. It is a form of art that is expressed for joy and festivities. You can start with a circular centre infused with intricate patterns and decorate the rest with floral, leafy and curvy motifs. 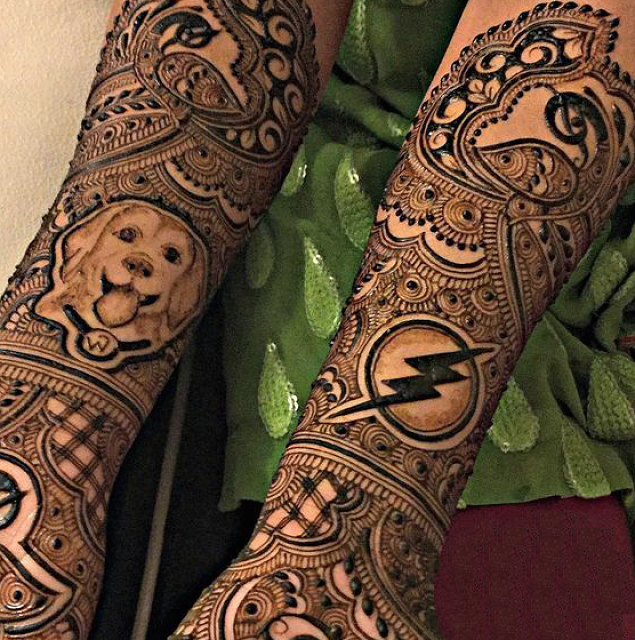 Another stunning Mehendi design is multiple chakras. It is crafted with circular patterns in repetition to form a crown-like design. Combine it with teardrops and jaal to give yourself a pleasing picture.